– In medium bowl, stir together all ingredients except Scoops; cover and refrigerate until ready to serve. – Just before serving, and using a small spoon, fill Scoops with salsa or let guests scoop as they go! 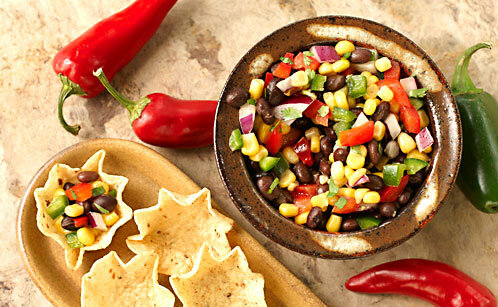 -Other fillings include mango salsa, fresh tomato salsa or your most favorite salsa—as long as it is not too watery. -Fill just before serving time; otherwise the “Scoops” will get soggy. that could be assembled in minutes and put in to bake before supper. I enjoyed countless evenings on Grandma’s front porch, eating cobbler for dessert and watching the cars go by. Although we usually had blackberries, raspberries or huckleberries in the Blue Ridge mountains, I now live in New England where we have excellent blueberries. Try this coffee-cake style cobbler for breakfast or brunch with some sweetened whipped cream and a cup of good strong coffee. Thanks for the inspiration, Grandma! – Preheat oven to 350°. 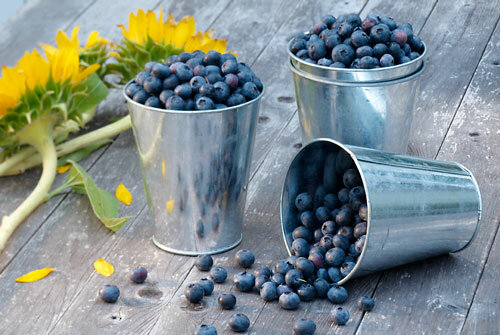 – Pick over blueberries, removing any stems. Rinse with cold water and drain in colander. – In large bowl, stir together sugar, crystallized ginger and cinnamon. Add blueberries and stir gently to coat with sugar mixture. – Prepare cake mix according to package directions, adding the vanilla and ground ginger. – Spread blueberries evenly in bottom of 13 x 9-inch baking dish. Pour cake mix over blueberries. Bake 35 minutes or until wooden pick inserted into cake (not blueberry layer) comes out clean. Cool on wire rack. – When cool, dust with powdered sugar. Serve with sweetened whipped cream or vanilla ice cream. Ask people how they like their chili and you’ll get a variety of answers. Mild or caliente, vegetarian or con carne, everyone has an opinion. Chili brings out our experimental side, and almost anything can be thrown into the pot; as evidenced by the many chili cook-offs occurring across the country each summer. One such cook-off that I’ve frequented over the years is the summer chili cook-off at Saratoga Race Course in upstate New York. Come August at the Spa, it’s High Society and horses in the paddock, and folding chairs & coolers behind the grandstand. Saratoga’s 40-day summer meet is the “crème de la crème“ of thoroughbred racing, boasting a stakes race each and every day. The historic grandstand & race course has even been named one of the worlds great sporting venues by Sports Illustrated magazine. So if you’re looking for one last day-trip to your never ending summer, set a course for upstate New York, where the horses will be running through Labor Day. 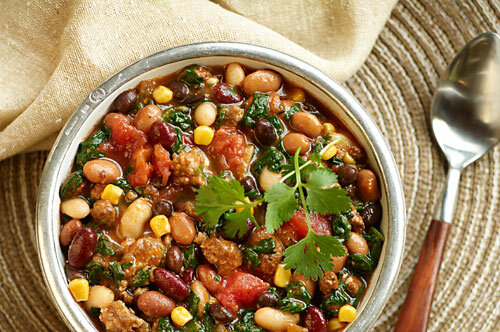 Can’t get to the Spa… then try my summer chili recipe. It takes me back there everytime ! – In large skillet brown ground beef and sausage; drain and spoon into Crock-Pot. – Add remaining ingredients. Cover and cook on Low for 8 to 10 hours. – Leftovers can be frozen. – Any combination of beans can be used. – Seasoning can be adjusted to your taste buds. – To make a vegetarian version, remove the beef and sausage and add your favorite vegetables such as zucchini, carrots, yellow squash, butternut squash, bell peppers, etc. Hard-Boiled Eggs or Hard-Cooked Eggs? That is the question! The secret to a perfect hard-cooked egg is not to boil them! Here’s the formula: Place eggs in a pot. Cover with cold water. Heat water just to a boil. Immediately remove pot from heat. Cover and let stand 12 minutes. Mmmmm – egg-cellent!…a beautifully cooked yellow yolk every time. During your travels this summer, take advantage of farm fresh eggs. If you are lucky, you can purchase them locally all year round. Okay, since I am shelling out tidbits on eggs, here is another one. 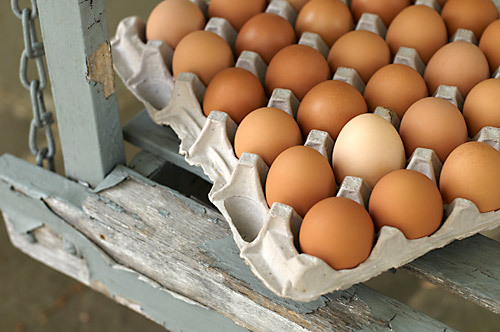 Is there a difference between brown eggs and white eggs? According to my research, there is one major difference between brown eggs and white eggs. Brown eggs are brown and white eggs are white! That’s it! Just the colors of the shells. There is no difference in nutrition and taste. Brown eggs come from hens with red feathers and red ear lobes. White eggs come from hens with white feathers and white ear lobes. Now that you are more egg-ucated on the subject of eggs, I am going to sign off before I make another bad pun! © Joe Longo 2014 and à la Carte Kitchen. Unauthorized use and/or duplication of this material without express and written permission from this blog’s authors and/or Joe Longo Photography is strictly prohibited. Excerpts and links may be used, provided that full and clear credit is given to the author and à la Carte Kitchen, with appropriate and specific direction to the original content. Enter your email address for a free subscription to this blog and receive notifications of new posts by email. 20 Savory Popcorn Recipes - Moneywise Moms on Back, by POP-ular demand! Lady From USA on Sweetest Witch Ever!